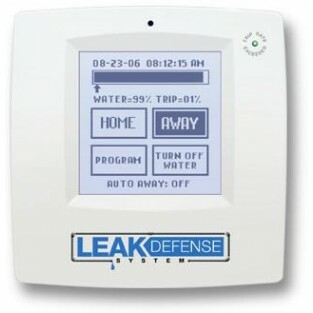 The Leak Defense System (LDS) is a water flow monitor and alarm system for detecting leaking water pipes or fixtures in residential and commercial building structures. The leak detection sensor probes have no moving parts to wear out and tests have verified the device can detect water flow as little as eight ounces per hour and as high as several gallons per minute. The leak protection sensor probes are mounted directly into the main water supply and detect all water flow within the supply side of the structure. The alarm function can be set to alert the owner or a surveillance company monitoring the premises. An unabated alarm condition will result in the device initiating its motorized ball valve to halt water flow within the structure. Also integrated into the system are helpful user guides and other features designed to aid a homeowner or a plumbing professional in detecting a leak. The touch-screen control panel is intuitive, easy to use and attractive. Its display provides real-time system and flow status. The panel has been designed to indicate any alarm condition, regardless of whether it is a very large or a very small leak. The panel will identify the flow level that caused the alarm to occur and it will sound a built-in audible alarm to notify the homeowner of the problem. If the device halts water flow due to an alarm condition, the control panel will provide information to guide the homeowner through the process of identifying and managing the cause of the alarm. The panel is also used to select operating modes and to program personal preferences. When the LDS is connected to an auto-dialer telephone device, it can alert anyone with a telephone when there is an alarm condition. Point of leak detectors (see page 15) may also be connected to the LDS to coordinate moisture and leak detection throughout the entire structure on both the supply and the return sides. The LDS also improves resource conservation and provides water cost savings by detecting unknown water loss long before thousands of gallons escape down the drain or into the structure's foundation. Sentinel Hydro Solutions Leak Defense System LDS-2-200, 2 inch in Brass. The manufacturer warrants its products that are sold and installed in the United States to be free of defects in materials and workmanship under normal use and service for a period of two (2) years from the date of purchase by the end user. The manufacturer's obligations shall be limited within the warranty period, at its option, to repair or replace the product or any part thereof. In order for the warranty to apply, the Leak Defense System must be installed by a licensed plumber, licensed General Contractor plumber, licensed General Contractor or approved installer. The manufacturer shall not be responsible for dismantling and/or reinstallation charges. Neither the manufacturer nor the seller of the Leak Defense System shall be liable for any damage or loss whatsoever whether directly, indirectly, consequentially or otherwise, caused by the malfunction of the product. The product is not designed to prevent leaks, but rather to identify possible leaks caused by a variance in water flow over time. The manufacturer shall not be responsible for damages including but not limited to, damages for loss of profits, goodwill use or other intangible losses (even if the manufacturer has been advised of the possibility of such damages) resulting from the failure of the Leak Defense System or associated equipment. The manufacturer does not represent that its product may not be compromised and/or circumvented, or that the product will prevent any flood or amage to property resulting from a water leak or otherwise that the product will, in all cases, provide adequate warning or protection. Damage or operational deficiencies due to water quality issues such as sediment or scale accumulation. Replacement of house fuses or resetting of circuit breakers. Damage to the product caused by accident, fire, or acts of God. The above is in lieu of all others warranties; guarantees, statements expressed or implied and the items listed are not intended to be all-inclusive but rather representative of items not covered. The warranty is limited to the express warranty set forth herein. No warranty whether express or implied shall apply beyond the limited warranty period outlined above. Some states do not allow limitations on whether an implied warranty applies or how long an implied warranty lasts, therefore the above limitation may not apply to you. To know what your legal remedies or rights might be, consult your local state consumer affairs office or your state's Attorney General.